Horror and comedy is a tricky formula to get right, many times there can be too much of one and not enough of the other. Recently I was able to check out the Ottawa premier of A Little Bit Zombie, a slickly written and well produced little-big Indie-horror, home grown (well my home) in Canada. The film was directed by Thunder Bay, ON native Casey Walker, and brought to us by Cave Panting Pictures and the producers list is as long as my arm because the film was crowd funded which explained to me how it looks so good and managed to snag fantastic actors. The story is about a soon-to-be-married couple named Steve (Kristopher Turner) and Tina (Crystal Lowe) Tina is the typical perky but overbearing control freak that is dreaming of the perfect wedding while Steve is the mild mannered HR representative that is just looking forward to a quiet and stable life. They head on up to a weekend vacation at the cottage with Steve’s sister (Kristen Hager) and her husband Craig (played by a very buff looking Shawn Roberts). Unknown to the foursome is that a short distance away two professional Zombie hunters, Max and Penelope (Stephen McHattie and Emilie Ullerup respectively), are taking down a small outbreak while one of the undead are bitten by a mosquito. The insect becomes infected and makes its way to the cottage that everyone is vacationing at. Steve gets bitten by said insect and slowly starts to become infected. He retains his memories and personality, but starts to grow pale and lose the feeling in his body. Of course there is the unfortunate fact that he is unable to eat anything without projectile vomiting. With the hunters hot on his trail and his wedding just a week away, Steve and his family try to cope with the reality that in order to stay sane he’ll have to consume the brains of living humans. I would say that on the horror versus comedy scale it’s leaning far more into the comedy area than anything else. The horror elements are there and, as a director, Casey Walker’s influences can be seen quite obviously (especially Evil Dead), but for the most part I would say the horror is pretty tame with nothing more or less grotesque than some of the mainstream comedies out these days. There are some great special effects though, and all in all, it was decent but I could have done with a bigger body count or a few more scenes with zombies. A few story elements I found somewhat confusing. One of the hunters, for example, uses a seemingly magical orb to locate the undead but as far as I remember they don’t really go into any detail about where they got it or how it works. Emilie Ullerup’s character Penelope also seems to believe that Steve is somebody who could eventually find a cure for the zombie plague since he can resist the effects somewhat, yet they never really explain how he is able to. Also I couldn’t help notice that the plot had similar elements to that 90’s comedy My Boyfriends Back which was essentially about a fun-loving but zombie afflicted teenager who still retained his mental capacity. Now that I think about it, I might be the only one who remembers that dumb movie. Documentaries have a unique position with me in that I can find myself getting interested in just about any subject if I happen to catch a decent doc about it. That being said Documentaries about horror are a particular favourite of mine. The best ones are usually a labour of love that hopes to showcase and educate its audience but Under the Scares seems to go a step further and tries to serve as a list of do’s and don’ts for anyone looking to break in to horror. The Documentary was directed by Steve Villeneuve and told through the perspective of the good folks at Digger films who are trying to get their very independent movie Stories of a Gravedigger made and distributed. It could have easily been kept as a personal tale about a few young filmmakers trying to make a movie but that only serves as a framework for the entire picture. Throughout every step they take into completing their film there are intriguing interviews from people all over the industry really providing the substance. Everything to proper planning, a good relationship between filmmakers and actors and even box art are touched on. Really this entire endeavour seems destined for film schools or anyone looking to break into indie horror. As I said before there are a tonne of people who contributed to this doc, George Romero, Lloyd Kaufman, Herschell Gordon Lewis and Sv Bell are just some of the people who not only have made names for themselves in horror but got their starts on shoe-string budget movies. All of them and many more actors, FX artist and the other main stays of horror that are interviewed have stories of triumph and defeat when trying to push their films out the door and it seemed almost therapeutic to some of them to vent their frustrations of the common mistakes they see from what is now becoming an oversaturated market of Indie horror that has come on the toes of the digital age. Not only are the technical aspects discussed but also making sure by the end of it you can try to build a career. 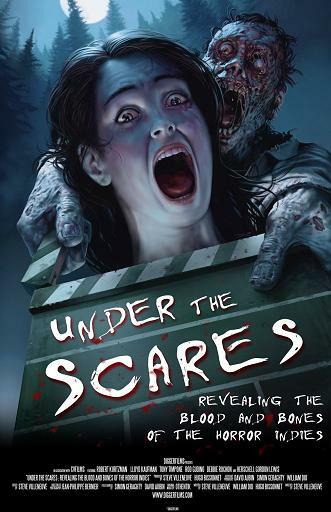 Under the Scares reveals an interesting world where distributors can hand pick what films they decide to promote and how much they would see for it. For many moviemakers it means getting next to nothing with little chance of ever building a career beyond that initial movie no matter how much money it could potentially make. There is a big message of self promotion and networking with a emphasis on making sure you are making good deals. Some of the most interesting advice coming from Hershall Gordon Lewis wasn’t really about breaking into notoriety with his splatterfilm Blood Feast but rather how to promote yourself and get that good deal where you’ll actually see the kind of money you were promised. There really is no pretty picture painted at all. They portray making these Indie films as truly hard work that will more than likely leave them penniless; which begs the question of why would anyone even want to consider doing it in the first place. The simple answer is passion for the genre and filmmaking in general and that is the overall message I think you can take away from it. The number one quality I judge any documentary no matter the subject matter is the sincerity in which it was done. Steve Villenenuve and everyone at Diggerfilms have made something truly sincere here. Not only does it show a casual audience just what it takes for that crazy horror dvd to finally make it to your hands but it’s also a can’t miss educational tool for anyone interested in making film. Check it out. There is something about foreign horror that always seems to make me gravitate towards it in the store. Today was no exception as my eyes caught Macabre sitting there among countless other DVDs. I had never heard of it before but the box said it all. A creepy woman looking out at me with a fork in her hand, skewered on the utensil was a severed finger and the tag line “evil has a mother” We’re off to a good start. Macabre is the first horror film I’ve ever watched from Indonesia and I had no idea what to expect but sometimes it pays to take a risk. Macabre or as it’s known in Indonesia “Rumah Dara” was released in 2010 by Gorylah Pictures and directed by the Mo brothers. The film stars Shareefa Daanish and Julie Estelle. The premise is something that is familiar in the most basic sense, a group of young people are packed in a car to see off a married couple Adjie and Astrid who moving to Australia. Along the way they visit Adji’s sister Ladya (Julie Estelle) who they convince to come aswell. While on the road they run in to a strange girl named Maya who tells them she has been robbed and needs a lift home. They agree and she leads them to an isolated villa in the middle of nowhere. When they arrive Maya introduces her to her family. Head of the household is her mother Dara (Shareefa Daanish) a strange and ethereal woman. The group decide they’ll stay for dinner but find out too late that their food was drugged, they all pass out and when they awake Dara and her family’s true intentions become clear. The group is to be harvested for meat because they believe that cannibalism holds the secret to immortality. Are they just a bunch of crazies or is this more than just a deranged cult? Movies that have the theme of a cannibalistic family, cult or whatever in the middle of nowhere is something that I have a love hate relationship with. On the one hand I try to watch as many of them as I can but on the other hand films like this end up being horror that I watch once and then am done with. Macabre on the other hand is something that I can’t wait to sit and watch again. This film starts off quickly and becomes relentless in its brutality. When characters are fighting for survival they are fighting back hard. Fights are gritty, gruelling and nobody just stays down with one hit. I honestly kept wondering how some of these characters could still be alive after some of the punishment they take. This is amplified by the special effects and tight editing. If you’re a gore-hound, this movie has enough blood to satisfy your urges. By the end of the movie the entire house seems washed in crimson. One of the films highlights is easily the Chainsaw versus sword fight. Both Ladya and Dara are soaked in blood with body parts and gore everywhere. Or another beautifully cringe educing scene involves the heel of a shoe and that’s all I’ll say. Even though this film doesn’t hold back at all in terms of what it’s willing to show I didn’t feel at any point that it was too much, even though this film has been reportedly banned in certain countries. Then again I’m not exactly sure what I would consider “too much”. Scene where somebody is for example dismembered with a chainsaw is actually handled rather artistically. Yes I did just say that. Daanish steals ever scene she’s in. Her character of Dara is hauntingly creepy as a mother who is obsessed with strength and the idea of living forever. She is subtle and restrained until the final moments and then she just lets loose and when she does it’s so damn effective. I can’t praise this film enough. It’s honestly one of the best horror movies I’ve seen in a long time and hands down my favourite in the sub-genre of “Cannibal family” horror. Do yourself a favour and watch it now. As I’ve said many times on this site. We love independent horror on Splatterpictures. That being said it opens us up to some things that can be pretty awful. Thankfully Deliverance from Evil manages to avoid a lot of the pitfalls that just make things with a smaller budget impossible to enjoy. Deliverance from Evil is brought to us by the good folks at Pumpkin Patch Pictures. It’s directed by Indie horror veterans the Quiroz brothers. The film stars Angel Avoles and Jose Rosete. The basic idea is that a couple move in to a new home with their young son who is taking a bath. Suddenly a mysterious force causes the boy to drown and it triggers a chain of events that forces the devastated parents to uncover the mysterious and tragic history of their new home and banish an evil force before it destroys them all. The film never loses focus of its story and that is one of the strongest aspects of it. Both Avoles and Rosete do a fine job portraying a couple who has just lost their son in a seemingly sudden accident. I think they both start off as likable characters that come off sympathetic and sincere in their portrayals. I also really enjoyed the secondary characters. The special cameo by Friday the 13th writer Victor Miller was also a nice little treat. He plays the sort of soothsayer mailman. One of the biggest problems I had with the film was the lighting. Supernatural horror relies on many things to create tension or fear. Actors have to do their part, music is also very important but you can’t ignore the lighting. Many of the scenes (in fact almost all of them) take place during the day or in well lit areas. In supernatural thrillers I often tease about how dark the films always are and how even when characters turn on a light it often makes little to no difference. As cheesy as the perpetually dark rooms can be there is something to be said for the atmosphere they create. Ghost stories like this rely on our imaginations to fill in a lot of the blanks. When you’re in a dark room your mind can play tricks on you and shadows can suddenly take shape into something horrific. Scenes where I felt there should have been a lot more tension just didn’t work because it was bright as day. The film did have more night shots towards the end and when certain scene were going on at night or in dimly lit rooms they were noticeably more effective. The special effects were great. I was glad to see some practical stuff which always looks much better than CGI when you’re dealing with smaller budgets. There is a great scene with a pillow indenting as if a head is reading on it that looks great. The effects on the ghost were decent as well but I would have liked to have seen more instances where the characters were encountering the ghost as oppose the just us as the audience seeing him. All and all the Quiroz brothers offer up well thought out character driven supernatural horror that is defiantly worth a look. The complaints I have are pretty minor and by the second half of the movie they are mostly fixed. The ending especially has a great creepy spin on it that sticks with you. Check it out!